"ZeroWater's 10 Cup Water Filtration Pitcher features a one-hand, push to dispense spigot that allows you to fill your cup or favorite water bottle without any lifting. The 5-stage filter transforms your tap water into delicious, TDS-free drinking water. All ZeroWater products include a free Water Quality Meter to test your water to ensure the highest quality filtration on the market. Get more out of your water with ZeroWater's 5- Stage Water Filtration. 10 CUP WATER FILTERING PITCHER: You'll always have cleaner, pure tasting water on hand with our BPA-Free, water filter pitcher in your fridge. The included, free water quality meter lets you test your water, so you never have to wonder about its quality. 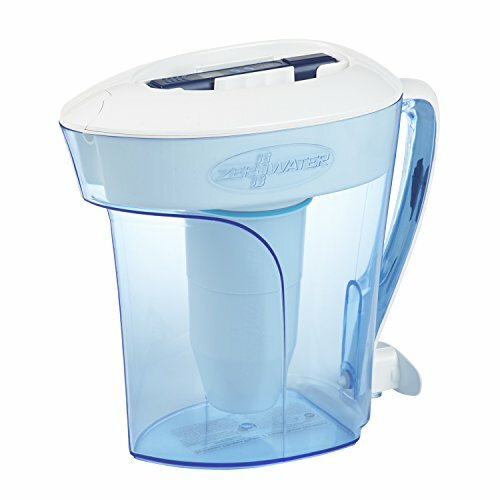 GET MORE OUT OF YOUR WATER: Remove more impurities from your water with ZeroWater's unique, 5 stage filter system. With a variety of options, you can have cleaner water anywhere, from pitchers, bottle filtration systems, or portable on-the-go cup filters.